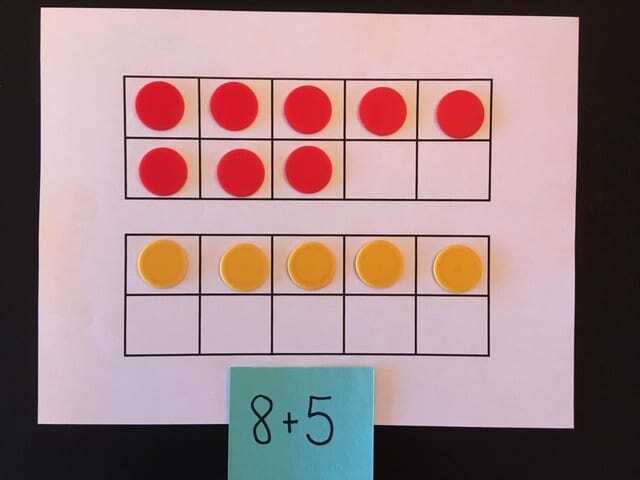 The example below shows the same problem, but this time move 5 from the first ten frame to the second ten frame to “make a 10.” That left 3 on the first ten frame. 3 + 10 = 13 (and 8 + 5 = 13). 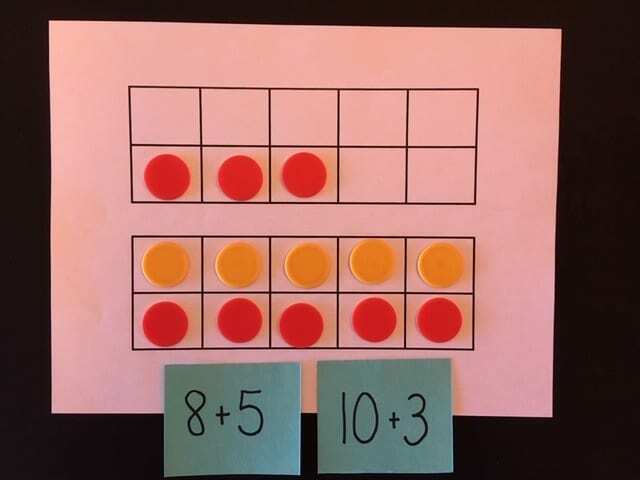 The making 10 strategy is also really helpful when adding 9. 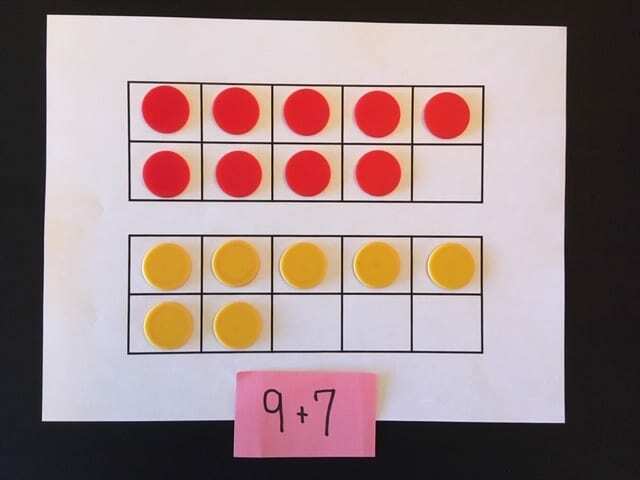 For example: 9 + 7 — We tell students to think 10 + 6, but showing them with the ten frame makes it less abstract when first learning. This is a pictorial representation of the same problems showing how to decompose one of the addends to make a ten. I LOVE, LOVE, LOVE using the add up strategy for most double+ digit subtraction problems. Making a 10 is the essential first step. There are a few ways to show this. 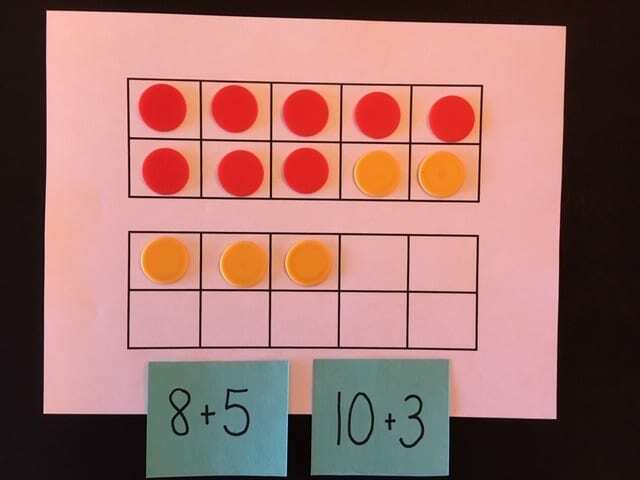 I’ll start with a concrete method first using place value disks. The problem is 100 – 37. Count up (Add up) from 37 to 100. It’s easy to see that by adding up, the answer is 3 + 60. Here’s the same problem using “The arrow way” from Eureka / Engage NY. Write 37 and an arrow pointing to the next ten (which would be 40). Above the arrow, write the amount added (3). 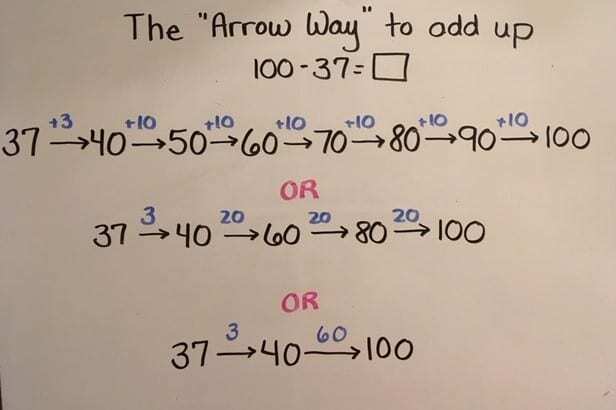 Add more arrows (or just one) to show the process of getting from 40 to 100. Depending on the students’ comfort, this can be done in one step or several. 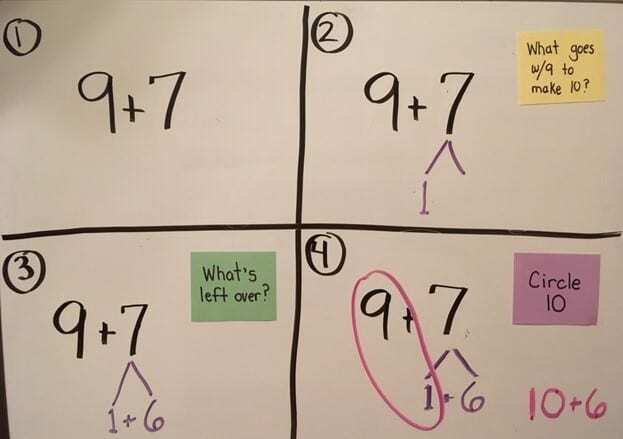 Add the numbers above the arrows. 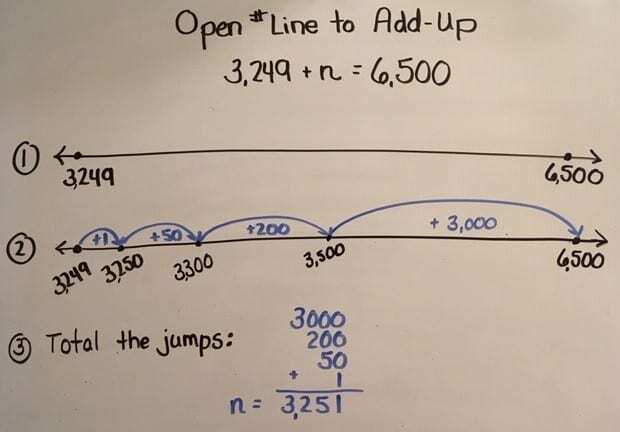 Here’s the same problem using an open number line, which is a great pictorial model showing the process. 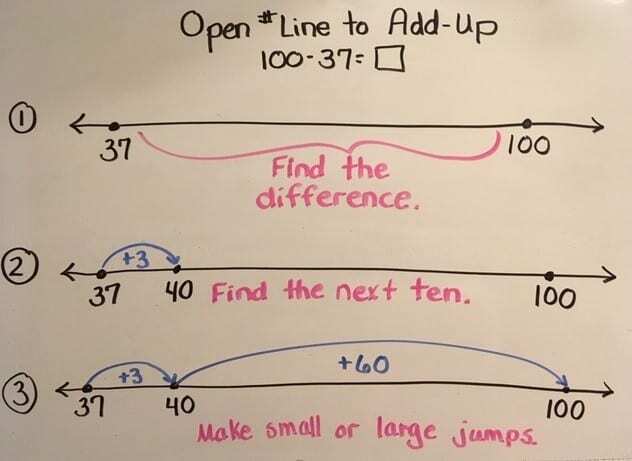 Using an open number line to count up / add up for a subtraction problem should help them see “the difference” between the two numbers. Place 37 on the left side of the number line. Put 100 on the right side of the number line. The task is to count up from 37 to 100. 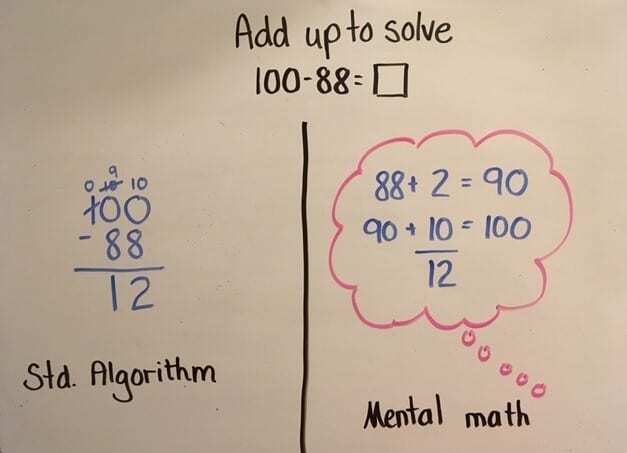 Now I’m not suggesting that we should ignore the standard algorithm, but using the make a 10 strategy is very helpful when doing mental math. It’s a very helpful strategy when paper and pencil or a calculator are not available. 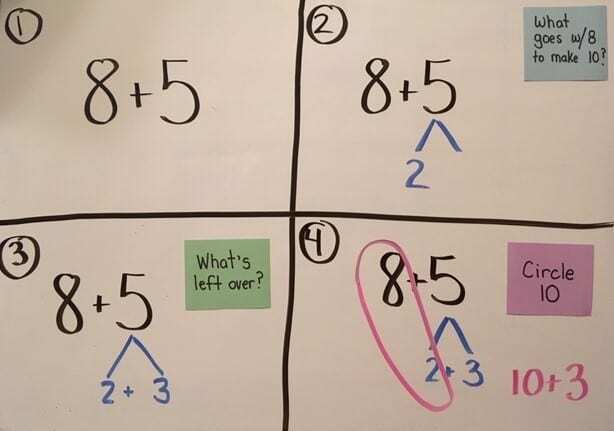 It’s also a helpful strategy for children to check their work. 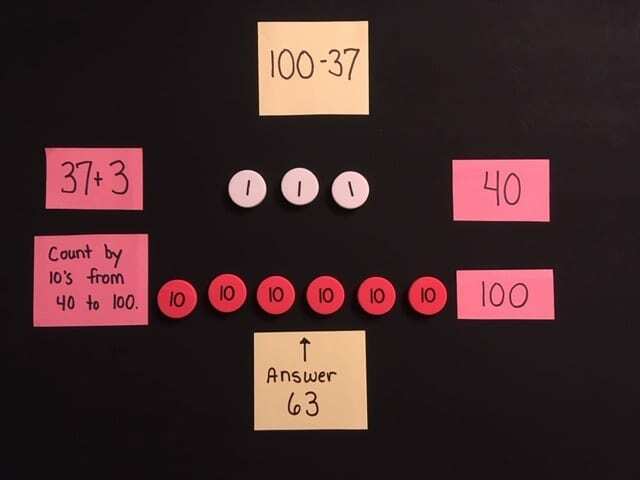 Instead of students asking, “Did I get this right?” I tell them to try a different strategy — if they get the same answer they are probably correct. 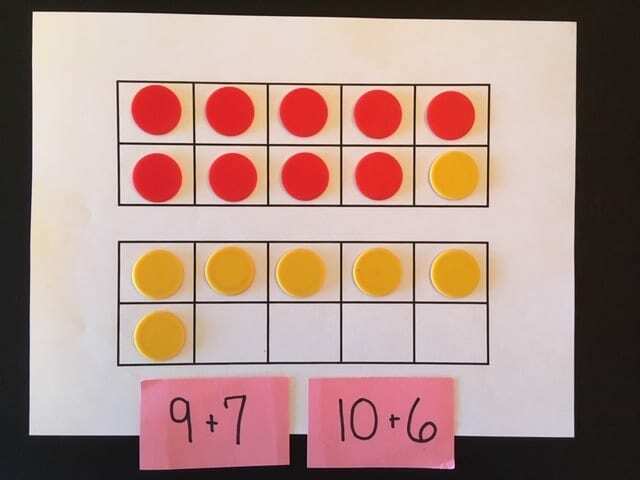 I have often asked students this question to see what strategy they use: “What is 100 – 88?” So many go right away to the std. algorithm – crossing out zeros, etc. when the adding up strategy would have been more efficient (88 + 2 = 90 and 90 + 10 = 100)!! Enjoy! 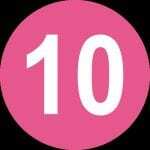 Let us know your favorite “ten” lesson or activity.